The work of Urban Squirrels is two-fold: rescue and advocacy. As far as rescue is concerned, January is a quiet month. Some squirrels, too young to be safely released in autumn, are staying with us till late April or early May. Some of them are inside, some in the outside aviary. They are all doing very well. They thoroughly enjoyed recycling the neighbours’ Christmas trees and are patiently waiting to go back to the wild, where they belong. They are fed and have their aviaries cleaned every day by Jonny, my adult son with autism. He cannot handle our furry clients, so the syringe-feeding of the very young babies is my job, but, once the babies are weaned, Jonny comes into his own. On the advocacy front, quite a lot has happened. The petition on Care2, https://www.thepetitionsite.com/775/026/354/stop-culling-healthy-animals-in-londons-royal-parks/ , asking London Royal Parks to stop the culling of healthy animals, is doing well. It is growing organically at the rate of about 500 signatures a day and has now reached 111,000. The campaign is supported by Care2 itself, by Animal Aid, London Wildlife Protection, Stop the Deer Cull initiative, Farplace Animal Rescue and Humane Wildlife Solutions. I wrote to the Royal Parks authorities informing them of the petition. Their response was encouraging inasmuch as they stated that they are keeping abreast of developments and that they are in principle open to policy change, but not encouraging inasmuch as they did not indicate any particular policy change that they might be prepared to adopt. I made a few suggestions and asked for a face-to-face meeting. It remains to be seen whether they want to negotiate. In lieu of the February update, here is an article published about us by the Anglican Society for the Welfare of Animals in their Animal Watch magazine. Urban Squirrels is a non-profit organisation that specialises in grey squirrels – rescue, advice and advocacy. Grey squirrels are charming and intelligent animals that have adapted to live in a variety of habitats. They entertain people by their play, help them to reconnect to nature, encourage them to take exercise and enhance mental health. In the urban environment, they are often the only diurnal wild mammals that people see on a regular basis. Squirrels are also known as some of nature’s greatest conservationist: they plant new trees by caching seeds, provide food for birds by encouraging fungus growth and insects through their own feeding behaviours, create new wildlife habitats by “felling” old trees. Urban Squirrels was founded three years ago by me, Natalia Doran, and my son Jonny, who is a young adult with autism. Jonny has always wanted to work with animals and, with the help of one-to-one behavioural therapy, studied for and received his Diploma in Animal Care. Finding actual work however, even in a voluntary capacity, proved impossible. Jonny is clever, dedicated and strong, but also profoundly handicapped, with very little understanding of danger or capacity to deal with a changing environment. So the only way forward was to create a working environment for him in our home that was tailored to his needs, making it impossible for him to fail. Thus Urban Squirrels was born. Now the “division of labour” is such that Jonny does all the feeding, cleaning and heavy physical tasks, while I deal with the advocacy side of the work and do the hand-rearing – every four hours round the clock, in case you think I have the easy part. We are licensed by Defra and take referrals from vets, tree surgeons and directly from members of the public. The bushy-tailed clients are given medical treatment when necessary, hand-reared if they are too young to cope on their own, over-wintered in the case of late autumn babies, and then returned back to the wild using the soft release method. The advocacy involves running stalls and giving presentations at vegan festivals and animal welfare events, responding to articles about squirrels in the media and giving interviews when approached by media researchers for additional information. The problems that red squirrels face in this country are explained by habitat loss – deforestation as a result of human activity, and not by the presence of their grey cousins. Red squirrels became very rare, to the point of extinction, by the end of the 18th century, before the greys were introduced, and had to be repeated reintroduced from Scandinavia. Killing grey squirrels is not an effective way to conserve the reds. While it is true that squirrels, both reds and greys, feed on trees (leaves, twigs, buds), this does not destroy the trees, but only changes their physical appearance. Squirrels are in fact essential for forest regeneration. As far as the birds are concerned, an extensive government-funded study has concluded that grey squirrel activities do not reduce the bird population as a whole. If you are interested in finding out more about the work that we do (as well as check out the references to scientific papers backing our advocacy claims), visit our websites www.urbansquirrels.co.uk , the Urban Squirrels Facebook page and the Stop the Grey Squirrel Cull Facebook page. The baby season came upon us early and suddenly. The first couple, Bridget and Betty, came from a loft. The people who hired the workman to repair the loft put the nest on a shed roof, hoping that the mother would come back for the babies. Actually, she did come back and took one. Grey squirrels are very resourceful creatures, who would normally have a second or third home ready in case the first one is damaged. However, the mother clearly decided to cut her losses and take only one baby. So Betty and Bridget were brought here, and are now well settled. They were very small and helpless, just 2 weeks old, but are both doing well at the time of writing. The second group were another typical story: tree surgery victims. The trees in question belonged to a very nice couple, who were forced by their neighbours to cut down the trees, in spite of it being the breeding season for squirrels and birds. The tree surgeon put the nest out for the mother squirrel to come back to, but she did not – the noise of the work must have been too much for her. The day was cold and wet, and it was not practical to leave the babies out for too long. So to Urban Squirrels they went. This group is older than Bridget and Betty. At the time of arrival they were about 4 weeks old, their eyes just opening. As always in a large sibling group, one baby was particularly weak and probably would not have survived in the wild. With a bit of extra love (and, inevitably, worry) he is now doing well too. The over-wintered juveniles are going to the release sites. They will stay there in the release cages for a couple of weeks, to get used to the big wide world, after which the doors will be opened for them to come and go. They can come back to the cages for as long as they feel they need them. Most of them move out within a week of the doors being opened, but come back to the garden from which they were released if there is food on offer, which there usually is. March was a busy month on the advocacy front also. Ealing Animal Charities fair, Viva! Festival in London, Vegfest Brighton (the biggest, and hence the best financially, of them all). I do my best to write letters to the editor whenever squirrels appear in the news. Westmorland Gazette published my letter, which is very useful, because the catchment area is where culls are heavy and where even more culls are planned. There has also been a spate of interviews, from student films and magazines to PhD and Radio Five Live. The spring baby season (squirrels breed twice a year, with another lot of babies appearing in late summer and early autumn) started with two straightforward groups, one from a loft and one from a tree surgeon – straightforward cases, since the little ones went from the mother’s care directly to us – but continued with what turned out to be a catalogue of extreme rescue cases. a young squirrel reported to have been hit by a car, who came in with head trauma and struggling for breath and with diarrhoea that was pure blood; when I first saw the little one, covered in blood and mud, I did not believe that the state she was in was compatible with life, however, she is doing well at the time of writing, as are all of the above. Needless to say, with all this going on, there was not a great deal of time for advocacy work. However, Freedom of Information replies came in, from Defra and from the Royal Parks. Defra, whom I asked about the money given to land-owners to kill squirrels and about research into oral contraceptives for squirrels (Gonacon, reported by the press as being researched by Defra laboratories in York), wriggled out of answering. I suppose Gonacon research is, technically, an animal experiment, and animal experiments are exempt from the Freedom of Information Act. The Royal Parks did supply the information requested (the number of birds and mammals killed in each park in 2017). The numbers are depressing. I am working on a possible press release in this connection. Just before the difficult babies started coming in, we were invaded by a camera crew from a European TV company doing a feature on grey squirrels. Very welcome invasion, of course, since the persecution of grey squirrels rests on misinformation and exaggeration, so any publicity is always welcome, and a few seconds of film of a baby squirrel drinking her formula from a syringe should go a long way to making people more aware of the debate, at least. 7 hours of filming should result in about 7 minutes of TV time, I will let all the squirrel friends know when it can be viewed. The feature will present both sides of the debate, of course, and there is no way of knowing how the final editing will pan out, but at least we have stated and showed our case. Going by the rule that a picture is worth a thousand words, I have decided to make this months’s update a link to the feature on grey squirrels that was broadcast on the Arte culture channel in Europe. The programme included about 6 minutes on our rescue, at 10:30 – 13:50 and 21:30 – 24:36 https://www.arte.tv/en/videos/079474-016-A/re-britain-s-squirrel-wars/ Please note that the rest of programme covers the full spectrum of opinion and some footage from “the other side” will be very upsetting, and there is a lot of it. Here is an article about us that appeared in the Animal Aid magazine Outrage, in the “Animals I have known” section. My son Jonny, a young adult with autism, and I run a licensed wildlife rescue unit called Urban Squirrels, that specializes in grey squirrels: rescue, advice and advocacy. Akon came into out life as a week-old baked bean of a baby A tree surgeon accidentally destrtoyed the nest where Akon and his two sisters lived. (Dear friends, try not to commission tree surgery in the breeding season for birds and squirrles, March to September.) The tree surgeon was a compassionate person, and started phoning around for a rescue centre for the little squirrels. Unfortunately, a cente needs a licence to keep and release grey squirrels, and it took such a long time to find a licensed rescue that two of the babies died. One wonders why it is possible to breed and sell, for example, African hedgehogs to one’s heart’s content, when to rescue grey squirrels, all sorts of bureaucratic hoops have to be jumped through. Anyway, Akon was the lucky survivor. I collected him, warmed him on a hot water bottle and started establishing a feeding routine Baby squirels are fed with a syringe and a specieal teat, and the first few meals are always rehydration fliud.Then special widllife formula is gradually introduced. At this stage, Akon needed to be fed every few hours around the clock, with toileting at each feed as well. Grey squirrels do very well in rescue, once they are setlled in with competent carers, and Akon was no exception. He was soon joined by a couple of other orphaned babies – it is not ideal to bring up a single baby squirrel. At four months of age, the happy little group, by then fantastic acrobats, with teeth strong enough to open walnuts, were released back into the wild where they belong. The squirrel breeding season runs between April and October, with the peaks, as far as rescue is concerned, in April and May and then in August and September. Thus July is a relatively quiet month, and my son Jonny and I took advantage of that quietness to dismantle and deep-clean the cages and to redecorate the room that the squirrels are normally in. A TV producer visited and discussed the possibility of filming Urban Squirrels as part of a short series on small-time rescue. The most exciting thing she was able to observe was the paint drying, so we are not sure at this stage whether the filming would go ahead. Any opportunity to promote a positive image of our bushy-tailed clients would be most welcome, but we have not heard back from the production team; it is possible that we are a bit too controversial for the format of the programme, because the animals we specialize in are not a native species. We will have to see. On the advocacy front, the national animal protection organization Animal Aid has produced post-cards that we are encouraging people to sign and post off to Wildlife Trusts to ask them (reasonably and politely) not to cull grey squirrels as part of their ecosystem-management. If you would like a few cards for you and your friends to sign and send off, please email nataliadoran8@gmail.com telling me how many cards you could use and where the send them to. At the end of the month, particularly after the storms that followed the heat-wave, new babies started coming in. One was found by the road-side, but, scary as it sounds, shows no sign of having been hurt. Another intake was a sad one: two new-born babies, umbilical cord still attached, weight below the normal birth one, both very weak. The little girl’s body was beginning to give up already, and, sadly, she passed away shortly after she was dropped off. The little boy is getting stronger, so there is hope that at least one will be saved. 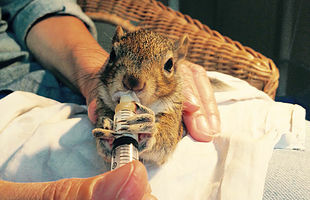 Neo-nates are not considered viable even by some squirrel-friendly rescue centres and are often euthanized as a matter of routine. Needless to say, we fight for every single life, but the success rate with new-born pinkies is only about 50%. Everything crossed for the surviving little one! I posted a picture of him on the Facebook page (https://www.facebook.com/1683622651895014/photos/a.1687339288190017.1073741829.1683622651895014/2105880349669240/?type=3&theater), looking even pinker than he did in normal life. By now his skin has taken on a slight grey hue, hinting at the fur that we hope one day will cover him. The best news is that Jack, the neonate who came in last month as little more than an embryo, and whose fate hang in the balance, is doing very well. About to turn 6 weeks, he is a very large and very strong squirrel, who loves his food. Please visit our Facebook page is you would like to see pictures of Jack’s progress. August is a busy month for baby squirrel rescue, and Jack has been joined by several others, who are all enjoying their formula, their heated tanks and their logs that they practice climbing skills on. The little ones are fed every four hours, round in the clock in the case of babies with their eyes still closed. They also need toileting at every feed. At this stage the little ones are entirely my responsibility (my adult son Jonny takes over once they are weaned), and it does keep me busy, to say the least. In spite of the business, I continue with my post-feed late morning routine of drinking a cup of tea and writing letters to newspaper editors in defence of grey squirrels. One such letter was published, by the Courier: https://www.thecourier.co.uk/fp/uncategorised/707486/media-coverage-is-part-of-the-problem/ Please scroll down to the fourth letter from the top if you would like to ready our contribution. TV filming is also set to go ahead at some point in September. The producers are particularly interested in filming Jonny, who is a young adult with autism, looking after the older squirrels. Needless to say, we are also very interested in putting across a positive image of our grey friends. The petition is still live, in case anyone else would like to sign it, because the campaign continues until all the animals are safe. September is the month when most of the clients here at Urban Squirrels begin weaning. Grey squirrels need formula for a surprisingly long time: until the age of 7 weeks it is the main part of their diet. They may play with nuts and bits of fruit and vegetables from the time they open their eyes at about 4 or 5 weeks, but they can only make a wonderful mess by shredding these things, not take any appreciable nourishment from them. It is important that the little squirrels have an opportunity to play with solid food items – play is essential for all young – but they do need formula every 4 hours during the day, until their cheek teeth erupt at the age of about 7 weeks. Then the weaning starts, which is actually very gradual. We drop one feed a day and take the squirrels’ weight daily: if they continue to gain, it means that they are getting enough nourishment from the solids that they are playing with. Then another feed is dropped, and so on. Generally, by the time the youngsters progress to the bigger cages, at about 9 weeks, they think that they are far too grown-up for regular feeds. Most would continue to take at least some milk till about 12 weeks, but it is more of a treat, not something to depend on. Work continues on the advocacy front also. We have been filmed, over two days, for a Channel 5 documentary about people who rescue animals from their homes. The programme is conceived as non-controversial, so there was no opportunity to talk about the persecution that grey squirrels are submitted to in this country, but the hope is that a positive image of the animal will help more people to feel sorry for them and oppose the killing where it takes place. On Saturday the 22nd we joined up with Animal Aid, who produced a fantastic banner stating their opposition to the culling of grey squirrels, and took part in the People’s Walk for Wildlife, organized by Chris Packham. The event was attended by 10 000 people, who marched from Hyde Park to Downing Street to express their concern over various issues relating to wildlife. At article about the widely varying attitudes to grey squirrels in the UK appeared in the German JWD magazine (the youth version of Stern). The article talks about Urban Squirrels, but, inevitably, about the systematic killing as well. Please see our campaign page for details https://www.facebook.com/stopthesquirrelcull/ This is kept separate from the main Urban Squirrels page, because it contain quite a bit of upsetting material, and we appreciate that not all of you would want to see that. All of our clients here at Urban Squirrels are now settled for the winter, either in our aviaries or at the release sites where they originally came from and from where they are going to be released in April next year. These young ones are very active at the moment, as are their wild counter-parts, who are busy storing up food for the winter. During the winter itself, their level of activity will drop, though they do not actually hibernate. A couple of late arrivals proved very tricky. They came from another rescuer, who literally brought them back from the dead, but chose to hand them over to us because we have a good wildlife vet close by and because I (Natalia) can give injections. One of the ill little squirrels had a very bad face injury, which meant that his teeth broke both above and below the gum line. He will have to see the vet about them two or three more times, every 6 weeks. The other tricky little customer had to have an eye removed, because it had collapsed. And that was just the beginning of the trouble. The eye socket became badly infected, in spite of post-operative cleaning and medication. The infection turned into bacterial meningitis, so the poor little thing began to lose the use of this front legs. Thankfully, the meningitis responded well to antibiotic injections. At the time of writing the little squirrel still has two injections a day, but is feeling much better; has recovered he use of his front legs and is bouncing around. I get sworn at and scratched twice a day when I give him injections, but it is worth it! The over-wintering squirrels have settled into a routine and are all happy little souls. They get 7 or 8 nuts in shells a day (having flatly refused to eat rodent blocks that rescuers would ideally like them to eat), and a selection of fruit and vegetables. Butternut squash, blueberries, baby sweetcorn in small quantities, avocado, mushroom and apple are firm favourites. Squirrels will generally try anything once, but some things, such as the ones listed above, they will eat with gusto every day. They have deer antlers to chew on, a good source of calcium and a perpetual favourite, as well as fresh twigs from the garden. It is interesting to note that the squirrels in the aviary outside are noticeably fatter and furrier that the inside ones, even their tails are bushier. Their metabolism clearly responds to the temperature they live in. Another published article appeared in Brighton’s local Argus, and was occasioned by a tragic shooting of two squirrels in a small public park. https://www.theargus.co.uk/news/17231587.two-squirrels-shot-and-killed-in-brighton-park/?ref=mr&lp=2&fbclid=IwAR1bkDWnONgfaYsJYOyeMNUpWysG28ZXmCrmjj0f3cJXdJIiTggXrTcbc50 No witnesses came forward in the end to identify the criminals, but we hope that the publicity might put them off wandering around with a gun in future. On a brighter note: we had a wonderful fund-raising weekend at the invitation of the Lush Cosmetics store in Kingston-upon-Thames. The staff were very friendly and helpful, and we managed not only to raise some money, but also to distribute around 250 leaflets and talk to a lot of people about grey squirrels and their place in the ecosystem. As many of you will know, rescue centres throughout the country got a very nasty Christmas present from Natural England, the licensing body: an email saying that our licences to keep and release grey squirrels are going to be revoked, in line with EU Regulation 1143/2014 that has now been translated into British law as the Invasive Alien Species (Enforcing and Permitting) Order 2019. From March 29 onwards we will not be able to take in any injured or orphaned grey squirrels. Needless to say, we are going to fight for our right to look after our bushy-tailed clients, and are working with many other rescue groups and animal protection organisations to make rescue exempt from the above order. Urban Squirrels launched a parliamentary petition that, at the time of writing, has been signed by over 26,000 people. 10,000 signature entitle us to an official response from the government, which we are now waiting for. If the number of signatures reaches 100,000, the issue will be debated in parliament. All the troubles of the last couple of weeks make the very successful and enjoyable Animal Aid Christmas Fayre seem like a distant memory, but it did happen, and our stall received a lot of positive attention. The overwintering squirrels are thoroughly enjoying the festive season. They got their Christmas tree (that someone discarded early, probably because of going away), decorated with nuts and butternut squash, and had great fun picking off the treats, eating the buds and chewing off and dragging into their nest-boxes surprisingly large branches. Jonny, his older brother Tim and Natalia hauled in around 130kg of nuts from the post-Christmas sales. The prices were not as good as last year, but still a saving on what we usually pay. We have faith that the nuts will be needed, in spite of everything!